The Linux desktop revolution is just around the corner! 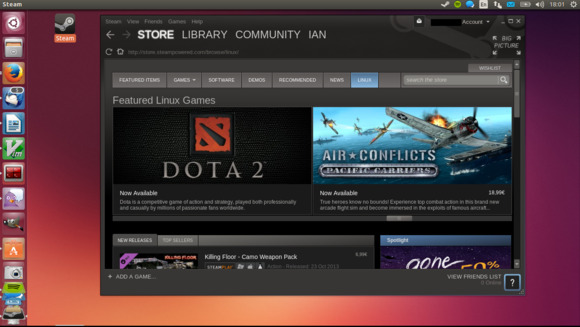 This is a familiar refrain that has received new life in recent months thanks to Valve and its efforts to turn Linux into a gaming platform with the Steam client for Linux (shown above) and the Linux-based SteamOS. Even Lars Gustavsson, the chief game maker for DICE, which is the EA-owned studio responsible for the Battlefield series, has a strong interest in Linux for games. There’s so much Linux love in the air that it prompted Linus Torvalds, overlord of the Linux Kernel, to tentatively suggest that Valve’s announcements could encourage Linux adoption on desktop PCs. Screech! Not again, I hear you say? Yes, we’ve heard the claim for years that the Linux (or GNU/Linux depending on your persuasion) desktop revolution is just around the corner. And yes, this could be just another high hope in a long history of high hopes, but Torvalds reinforced some important arguments about a Steam-powered rise for Linux. “I think [the Steam announcements are] an opportunity to maybe really help the desktop,” Torvalds said recently during LinuxCon + CloudOpen Europe in Edinburgh, Scotland. That’s not exactly a ringing endorsement for a Linux revolution but, if anyone is familiar with endless promises of Linux-based desktops becoming popular, it’s Torvalds. A criticism often leveled at Linux OS distributions—and contributing projects such as the Gnome desktop—is that each component insists on doing things its way, or going in a different direction, or breaking compatibility. This can result in fights over everything from the best bootloader to which desktop UI is superior (ridiculous since everybody knows Unity rocks). Some critics, such as Gnome project founder Miguel de Icaza, put at least some of the blame at the feet of Torvalds. Regardless of who’s at fault, most critics agree that the Linux desktop is a house divided right now, which is why a company like Valve and the success of Steam is so sorely needed. Already, Valve’s appears to be influencing how major hardware vendors approach Linux. Shortly after SteamOS was announced, both AMD and Nvidia announced improved driver support for Linux. And AMD’s low-level Mantle support could result in more top-tier games landing on Linux. But technology is only half the battle. As DICE’s Gustavsson said, it will also take that one killer app to really push Linux as a PC platform. That one game that everyone must play, but the only way to play it will be on a Linux distribution. Will that game come from Valve in the coming months? An early look at Half-Life 3 perhaps? Only time will tell. But hey, if you’re waiting for the Linux desktop revolution to happen you’ve got nothing but time.